Those of us who have been using an iPhone or iPad for a while have likely acquired a sizable amount of iOS apps through purchases, downloads, promos for temporarily free apps, and general promo code redemptions, many of which end up deleted or removed after the initial install. 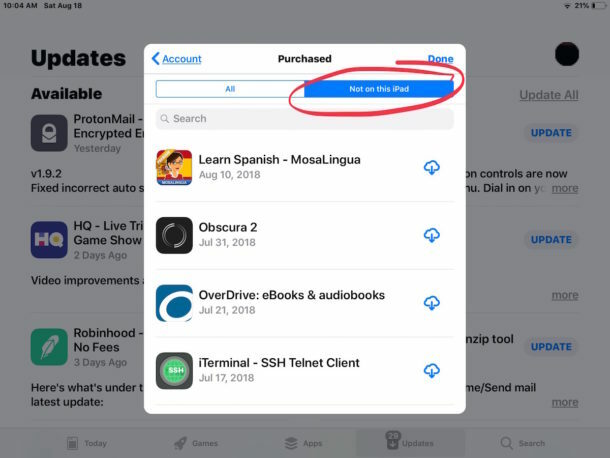 If you ever want to quickly see a list of every app that you own but don’t actually have installed on the current iPhone or iPad, you can do that through a great App Store trick which we’ll discuss here. Additionally, you can then go a step further and take action, choosing to download some or all those previously purchased or redeemed apps again to the current device, if you want to. Remember, app downloads and purchases are tied to a specific Apple ID, so you’ll want to be sure you are logged in using the same account. This is also one of the many reasons why it’s important to use the same Apple ID for all of your iOS devices over the years. Optionally, you can choose to download a specific app again just by finding the app name in this list, and then tapping on the downward pointing arrow cloud icon. Re-downloading apps that are listed here in the Purchased list is free. 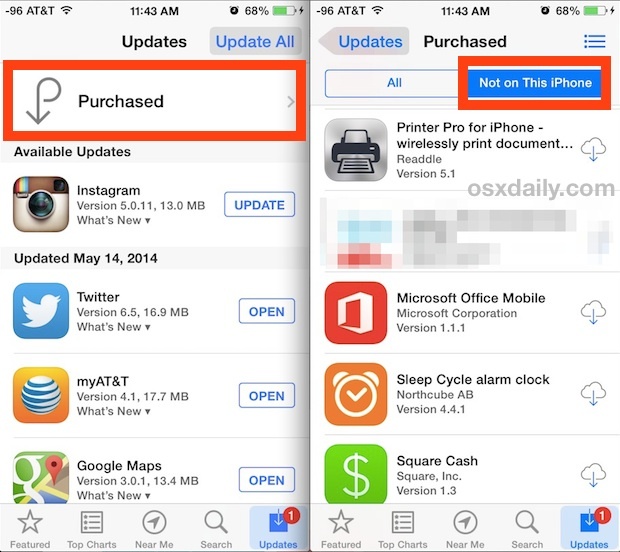 This offers an easy way to redownload and reinstall iOS apps on any iPhone or iPad. This is really helpful if you are restoring a device as new and want to selectively add some particular apps, and it’s also great if someone was using one of your iOS devices and accidentally deleted an app or ten, though in either case you can always just search the App Store for the specific application name and download it again that way too. Notice this is very different from getting a list of all apps you do have on the iPhone, which can be done through a simple Spotlight trick and does not require using the App Store. Thankyou for this info. Does it do it in order of what was last purchased and deleted at the top ect? No longer there as an option. Yeah, I don’t see it in the App Store on my new iPad with the latest iOS (August 2018). If it is there, it is hidden well. We know what this means. The marketing pukes now run Apple and playing their usual games. They assume that, if we have no way of finding what apps we own, we’ll end up buying some other app instead. I found where it’s hidden on iPads. Click on your user picture in the upper right and then onto purchased. You’ll get a list of your purchases in chronological order.